"Michael O’Shea’s sole, breathtaking album ranks among our favourite of all time - yet hardly anyone seems to have heard of it. Produced by Wire's Bruce Gilbert and Graham Lewis at the Dome studio in 1982, it's an utterly singular work of magick, meshing myriad, worldly modes into music that rarely fails to reduce us to tears. It's one of those albums that basically sounds like nothing else - the only record we can draw some parallels to is Dariush Dolat-Shahi's life-changing Electronic Music, Tar and Sehtar, despite it coming from the other end of the world. First brought to our attention by Blackest Ever Black at the start of this decade, we've gradually developed an obsessive fascination with its sublime, rapid dervishes and warbling rhythmelodies, so it’s a pleasure to see it finally made easily available to everyone who we’ve ranted about it over the years (2nd hand copies have been historically pricey and hard to come by! ), and especially replete with its enlightening new sleeve notes by archivist and writer Failed Bohemian. A busker among other trades, O'Shea was an itinerant soul who, after a childhood and formative years spent between Northern Ireland and Kerry in the south of the country, and extensive travel between Europe, Turkey and Bangladesh, created his own instrument - an electrified dulcimer known as Mó Cará (Irish for 'My Friend') - which he performed on at Ronnie Scott's, before later playing on bills with everyone from Ravi Shankar to Don Cherry, and also recording with The The's Matt and Tom Johnson. Aside from his two contributions to the Stano album, "Content To Dine In I Dine Weathercraft" (also recently reissued by Dublin’s Allchival), O'Shea's first and only album is the main point of reference for this unique artist. 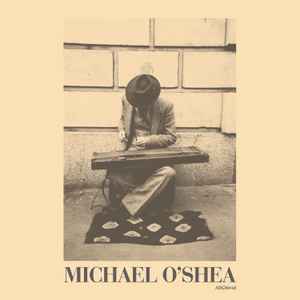 Like some eccentric expression of ancient Indo-European voices channeled thru a Celtic body, Michael O'Shea's improvised acousto-electric music intuitively distills a world of styles into singularly hypnotic works. Using his self-built instrument; a hybrid of a zelochord and a sitar, made on a wooden door salvaged in Munich, and with the crucial addition of electric pick-ups and the "Black Hole Space Box," O'Shea would absorb sounds from his travels like a sponge, and relay them back thru the instrument with effortlessly freeform and achingly lush results as elaborate as a Celtic knot or elegant as Sanskrit text. The mercurial flow of syncretised styles in 15 minute opener "No Journey’s End" catches your breath and doesn’t give it back, leaving us utterly light-headed and feeling something akin to religious experience, before his "Kerry" vignette most beautifully limns the epic coastline he hails from. The plasmic swirl and phasing of "Guitar No. 1" is perhaps the one piece that time dates the LP to the post-punk era, even if it could have come from ancient Mesopotamia, while the album and artist's underlying metaphysics bleed thru most hauntingly in the timbral shadowplay of "Voices," and the rapidly tremulous, animist voodoo of "Anfa Dásachtach." Noted in his lifetime, not least by himself as: "…joker, transvestite, inventor, psychonaut, actor, catalyst, community worker, musician, traveler, instrument maker," Michael O'Shea's life was, by all accounts, every bit as colourful as his music, which only makes his untimely death in 1991 all that more tragic, as we’d practically give an arm to hear what he could have made in the early techno era, as he was purportedly getting heavy into London's rave scene before he was taken. Honestly no other record has cast such a strong spell over us in recent memory - to the extent of sending us on wild goose chases on the wrong peninsula in Kerry - so please pardon the gush 'cos we can’t help but share love for this life-affirming disc and Michael O'Shea's beautifully transcendent music." Out now on Ireland's Allchival label.